Peppermint is not only one of the world's oldest medicinal herbs, but it is also one of the most versatile. The essential oil -- derived from its leaves -- has long been valued by herbalists and natural healers for its wealth of therapeutic effects, including antispasmodic and pain-killing properties. Although clinical studies haven't been performed on the antibacterial and antifungal effects of peppermint, researchers have explored peppermint's antimicrobial effects in laboratory -- or in vitro -- studies. Consult your doctor before using peppermint. 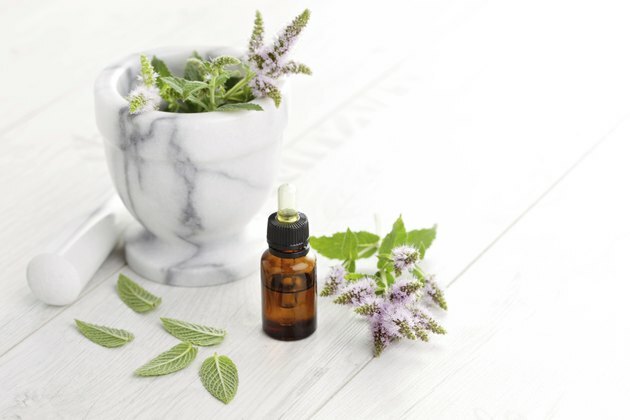 Peppermint oil is derived from the leaves of the plant botanically known as Mentha x. piperita, a perennial herb featuring squarish, purple-green stems and purple or lilac flowers. Two different varieties of peppermint -- white and black -- are utilized to produce pharmaceutical peppermint oil. White peppermint displays light green leaves, while the leaves of black peppermint are dark green. Peppermint was used in ancient Greece and Egypt as a culinary flavoring and medicine and was employed in traditional Chinese and Ayurvedic healing systems to treat colds, cramps, dyspepsia, nausea, sore throats and toothaches. Peppermint is presently used to treat digestive complaints, headaches, menstrual cramps and coughs, and it is used as an ingredient in warming and cooling topical preparations to relieve pain. It is also used commercially as a flavoring in candy and gum. Menthol -- a colorless crystalline compound -- constitutes 29 to 48 percent of essential peppermint oil, and is the primary component. More than 100 other constituents -- including menthones, caffeic acid, flavonoids and tannins -- are also present. Their amounts vary depending on the region in which the peppermint is grown. Peppermint shows antimicrobial properties in test tube studies, inhibiting a wide variety of pathogens. Peppermint shows potent antibacterial effects in vitro, as well as somewhat weaker antifungal effects. Peppermint is active against dermatophytic fungi, which causes athlete's foot and ringworm, in test tube studies. Peppermint also has antiviral effects in vitro, inhibiting the growth of influenza and herpes viruses. In an in vitro study published in 2001 in "Microbios," researchers found that peppermint essential oils inhibited the growth of many common bacterial pathogens, including E. coli, H. pylori, S. aureus, salmonella and methicillin-resistant Staphylococcus aureus, or MRSA. They concluded that peppermint oil showed potential as an antibacterial agent. In a study published in 2002 in "Journal of Agricultural and Food Chemistry," researchers found that the menthol in peppermint oil inhibited fungal microorganisms. Peppermint oil, which is available in enteric-coated capsules, may be taken in dosages of one to two .2-mL capsules two to three times a day. You can also make peppermint tea by pouring a cup of boiling water over 5 g of the dried leaves and allowing it to steep for ten minutes; drink 3 to 4 cups a day. Don't take peppermint if you have heartburn, hiatus hernias or gastroesophageal reflux disease; it decreases the pressure of esophageal muscles and can worsen symptoms. You shouldn't apply peppermint oil to the face, especially under the nose of a child or infant. Adverse reactions to peppermint include contact dermatitis, flushing and headache. Peppermint oil could interact with prescription drugs. Consult your doctor before taking peppermint oil; don't take it if you are pregnant or breast feeding. What Are the Benefits of Peppermint Extract?